Wide Asleep in America: New Israeli Math and the Return of the Holocaust Analogy:Steinitz: Iran "Equal to 30 Nuclear North Koreas." 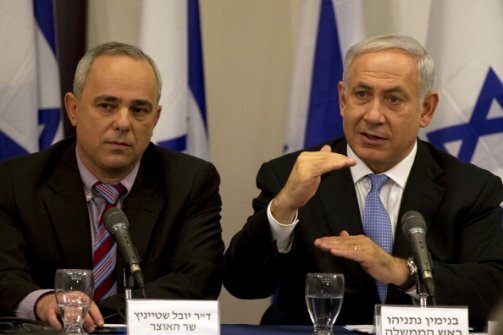 Steinitz: Iran "Equal to 30 Nuclear North Koreas." At the second annual Jerusalem Post Conference, held in New York City on Sunday April 28, a number of former and current Israeli officials offered new estimates about Iran's nuclear progress, issued threats of war and pretended Israel is more powerful and militarily capable than it really is. In other words, it was just another day of shameless and shameful Israeli propaganda; pathetic, jingoistic bluster meant to appeal to hawkish American donors, puff up Israel's inflated sense of self, and attempt to boost its already non-existent credibility. Former IDF intel chief Amos Yadlin said, "Even though Iran is on the way to crossing the line of Netanyahu, that doesn't mean that they have the bomb," which might be the most tediously self-evident comment made in recent memory, despite also relying on fact-free speculation. He also said that Israel could weather the consequences of a potential unilateral military assault on the Islamic Republic, but that, before that happens, "we must give more time for the other strategies that nobody takes credit for," an apparent reference to Israeli-led covert murder operations and cyberwar. Meanwhile, former IDF Chief of Staff Gabi Ashkenazi also told the mouth-breathing attendees that Israel can effectively attack Iran and sustain the inevitable blowback. "We cannot allow this regime to have the bomb," he said, before insisting that a recent multi-billion dollar U.S. arms sale to Israel "sends a signal" to Iran about Israel's military capabilities and intentions. The best comments of the day, however, were made by Israeli Strategic Affairs Minister Yuval Steinitz. Calling an Iran with an atomic arsenal "equal to 30 nuclear North Koreas," Steinitz's stand-up routine didn't disappoint. Not only was a "nuclear Iran" an "existential threat" to Israel, he said, it would also pose a "terrible threat" to all of the Middle East, Europe and the United States. Canada, Mexico, Central and South America, Africa, Australia and Antarctica would apparently be spared the devastating scourge, however. "Iran is problem number one of our generation," Steinitz declared. He then launched into an embarrassingly repetitive rant about how Iran is the new Nazi Germany, an analogy so stupid and played out that even its most ardent champion Netanyahu hasn't used it in a while. After praising Winston Churchill for his actions in the 1930s (which garnered a healthy round of applause from the crowd), Steinitz implicitly condemned other powers and political leaders for their past follies and failures, evoking the tired bromide equating diplomacy with appeasement. This was Nazi Germany, a secular regime with a fanatical ideology. And here we are speaking about the Shiite Ayatollahs of Iran. Totally [religious] fanatical regime. There it was Europe, here it's Iran. The Nazis spoke about the final solution for the Jewish people in Europe. They [Iranian leaders] are speaking about destroying the Jewish State in the Middle East. There are some differences. We have to learn from history. And so it never repeats itself exactly. And if there's a lesson to learn from history, it's not to repeat the same mistake again. And not to allow, come what may, the nuclearization of Iran. Once at full capacity, the Iranian nuclear program, he claimed, will be able to produce 20 to 30 nuclear bombs each year and somehow decided that, "if Iran gets the first few bombs, in a decade or so they will have 100 nuclear bombs." This was "not an intelligence estimate," he was quick to note, but rather was based on statements by the Islamic Republic itself, which makes literally no sense since Iran has never once stated any intention to build or acquire a single nuclear weapon. For good measure, Steinitz also tossed around phrases like “global ambitions" and "a new era of Islamic hegemony," because things like that - regardless of their sheer stupidity - play well with ignorant, racist audiences like the one assembled Sunday at the Times Square Marriott. Dismissing sanctions as insufficient "to achieve our goal," Steinitz demanded that "a very clear military threat" be made to Iran (ignoring, of course, that this is an undeniable violation of the UN Charter), "a credible threat that will make it crystal clear that they are paying something for nothing." "If there is a chance to resolve this problem without military action,” he said, it will only be because opponents of Tehran's nuclear program "choose a big enough stick and wave it in their faces," appealing to the Orientalist conception that Middle Eastern leaders only understand the language of force and will only kowtow to Western and Israeli demands when sufficiently fearful of potential violence. Former Israeli Prime Minister Ehud Olmert, who also spoke at the conference, tried to temper such alarmist rhetoric and dispel the notion that Iran poses an existential threat to Israel, one worthy of constant hysteria and attention. "I think that we have exaggerated, for a long time, the potential threat of Iran possessing nuclear power," he told the crowd. Predictably, Olmert's comments did not receive a positive reception; instead, he was heckled and booed.